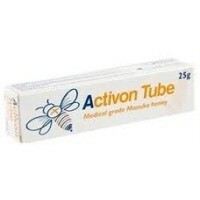 Activon Tube Medical Grade Manuka Honey has a reliable level of antibacterial potency not found in other honeys. Use on Advancis honey impregnated wound dressing for partial or full thickness wounds including: sloughy wounds, pressure ulcers, leg ulcers, surgical wounds, burns, graft sites and malodorous wounds. Simply twist off the cap, apply as top up to an Advancis honey impregnated wound dressing immediately prior to application to increase the concentration of honey.